In Intro to Comparative Politics, we devote a considerable amount of time to understanding regime types–what factors contribute to differences amongst authoritarian regimes, why democracies find it difficult to build deep roots in some places, what are the sources of authoritarianism and democracy. Sumit Ganguly, an expert on nationalism, and south Asian nationalism in particular, recently gave a talk at a round table organized by the Institute of Peace and Conflict Studies (which is based in New Delhi) on the sources of authoritarianism in Pakistan. The recent decision by embattled Pakistan President Pervez Musharraf to step down draws further attention to the nature of the political regime in Pakistan. Is there a causal link between Natural Resources and Conflict? The “resource curse” is the name given to the alleged causal links between a country’s abundance of natural resourcee and the existence of all sorts of “bad things”, such as authoritarianism, economic stagnation and/or outright economic decline, increased probability of attempted coups d’etat, etc. In our session on political economy we read Jensen and Wantchekon’s article on the link between natural resource wealth and authoritarianism, specifically, and we also looked at Richard Snyder’s article on the putative link between the existence of what he calls “lootable wealth” and political (in)stability in a state. Their conclusions were at times complementary but at times divergent. What matters (at least for political stability), according to Snyder, is the ability of the rulers (i.e., the government) to partake of the rents/riches accrued by the exploitation of the particular “lootable” resource. 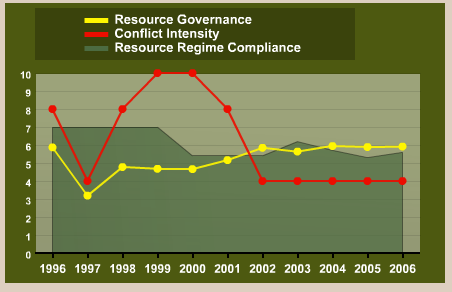 The Resource Conflict Monitor (RCM) monitors how resource-rich countries manage, administer and govern their natural resources and illustrates the impact of the quality of resource governance on the onset, intensity and duration of violent conflict. The RCM serves as a tool for identifying and supporting viable resource governance and contributes to conflict prevention, post-conflict reconstruction and sustainable development…. There is an informative, and user-friendly, application that provides historical annual information on conflict and resources in individual countries. Here is the result for Sierra Leone, the specifics of which should be familiar to those of you who watched Cry Freetown. For an explanation of “resource governance” and “resource regime compliance, go here and scroll down. The Polity IV data set code book, has a section entitled Indicators of Democracy and Autocracy (Composite Indicators), the authors write about the development of the state and the evolution of political participation as a corollary. If you read it in tandem with this post on Max Weber’s view of the state and state legitimacy, you’ll begin to understand the nature of the state and why it has become the dominant contemporary form of political organization. Three broad processes have reshaped the global landscape of state structures during the last two centuries One is an extraordinary expansion in the absolute and relative power of the state, a process that began i Europe. The new states created by the American and French revolutions marked the threshold between political world dominated by monarchies, whose claims to absolutism were belied by the fact that most social and economic life was autonomous from state control or extraction, and a political world in which state power was based on ever-widening control and mobilization of human and material resources exchange for broadened rights of popular participation. An integral part of this process was the development of bureaucracies with high capacities to regulate, tax, and mobilize people in the service of state policy. The second process was the transformation of the structures of political participation and legitimation. This transformation followed one of two paths, toward plural democracy or mass-party autocracy. The popular side of the bargain by which most West European rulers built state power in the nineteenth century was to acknowledge the right of widespread participation in policy making. That right was given institutional expression in elected assemblies which could review, and sometimes initiate, public policy; in elections direct or indirect, of chief ministers; and in recognition of citizens’ rights to voice and act on political opinions. The concept of bargain is a metaphor for sequences of political crises and reforms in which these rulers granted rights for participation, however limited, to all significant social classes and groups, while simultaneously extending the state’s right and capacity to regulate, tax, and mobilize the human and material bases of state power. are countries with weak policies, institutions, and governance. Home to almost 500 million people, roughly half of whom earn less than a dollar a day, fragile states, until recently known in the World Bank as low-income countries under stress (LICUS), have attracted increasing attention. Concern is growing about the ability of these countries to reach development goals as well as about the adverse economic effects they have on neighboring countries and the global spillovers that may follow. With their multiplicity of chronic problems, these countries pose some of the toughest development challenges. Poor governance and extended internal conflicts are common among these countries, which all face similar hurdles: weak security, fractured societal relations, corruption,breakdown in the rule of law, and lack of mechanisms for generating legitimate power and authority. As low-income countries, LICUS also have a huge backlog of investment needs and limited government resources to meet them. Past international engagement with these countries has failed to yield significant improvements, and donors and others continue to struggle with how best to assist fragile states. LICUS are characterized by weak policies, institutions, and governance. The Bank identified 25 such countries in fiscal year 2005. These 25 countries have a number of similarities: their infant mortality rate is a third higher than that of other low-income countries, life expectancy is 12 years lower, and their maternal mortality rate is about 20 percent higher. There are also important differences among LICUS. Some grew at around 4 percent per annum during 1995-2003. Others had negative growth rates of a similar magnitude. Some have abundant natural resources, while others are resource-poor. These differences are recognized in four business models that the Bank developed to work with countries in crisis: deterioration, prolonged crisis or impasse, post-conflict or political transition, and gradual improvement. 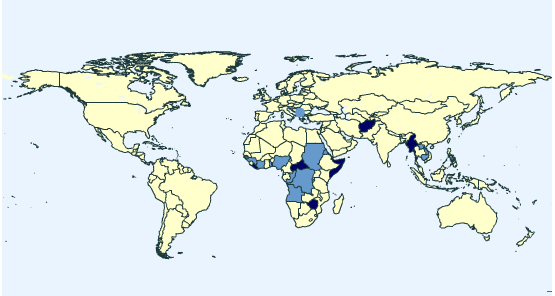 Countries in light blue are characterized as “core” LICUS countries, while those in dark blue are “severe” LICUS countries. Authoritarian regimes use both “carrots” and “sticks” in order to control their citizens. The “sticks” approach encompasses everything from surveillance to outright physical brutality. While the use of physical terror to undermine the bodily integrity of their citizens by authoritarian regimes is fairly well known, it is also evident that democracies are not immune to using this form of control over their populations. Almost by definition, authoritarian regimes terror-prone, but how much more so than democracies. You can fine the answers to this at the Political Terror Scale website, where they have a set of interesting interactive maps. How is “political terror” defined? Well, they have created a scale (from 1-5) which is an indicator of the level of political terror citizens in a country face in any given year. The definitions for each of the categories is below. Level 5 : Terror has expanded to the whole population. The leaders of these societies place no limits on the means or thoroughness with which they pursue personal or ideological goals. Level 4 : Civil and political rights violations have expanded to large numbers of the population. Murders, disappearances, and torture are a common part of life. In spite of its generality, on this level terror affects those who interest themselves in politics or ideas. Level 3 : There is extensive political imprisonment, or a recent history of such imprisonment. Execution or other political murders and brutality may be common. Unlimited detention, with or without a trial, for political views is accepted. Level 2 : There is a limited amount of imprisonment for nonviolent political activity. However, few persons are affected, torture and beatings are exceptional. Political murder is rare. Level 1 : Countries under a secure rule of law, people are not imprisoned for their view, and torture is rare or exceptional. Political murders are extremely rare.